Ben and Cate were late to school on Friday. I don't like to be late, but I was given a chance to lay down, step on, and crush my idol of Productivity. I failed at first. I rushed people around. I was snippy with everyone while I was frustrate with myself for laying in bed 15 extra minutes. God made her. Her hair isn't going to look like her friend's hair. She was created unique, both in her physical appearance and in every other way. As I told Cate about how God preapproves us because he made us and loves us and isn't waiting on is to perform perfectly, God was speaking to my heart. She wasn't the only one who needed the truth that morning. "Until you are convinced of God's incredible love for you, you will continue looking for replacement love everywhere but in the heart of Christ." This truth has been wrecking my heart lately. And I mean wrecking in a way that is ultimately good, even if it's painful and hard at some moments. I've been letting go of replacement loves, some of which are good things. But even good things distract from the best thing. Jennifer Dukes Lee wrote "Love Idol" not as an expert but as an encourager. Even the subtitle speaks volumes: Letting Go of Your Need for Approval – and Seeing Yourself Through God's Eyes. Jennifer's words, which really are God's message, have seeped into my everyday life. Isn't that where truth changes us anyway? In her book, Jennifer reminded me "any average moment in this life is never really average if we're living each ordinary moment for an extraordinary God." 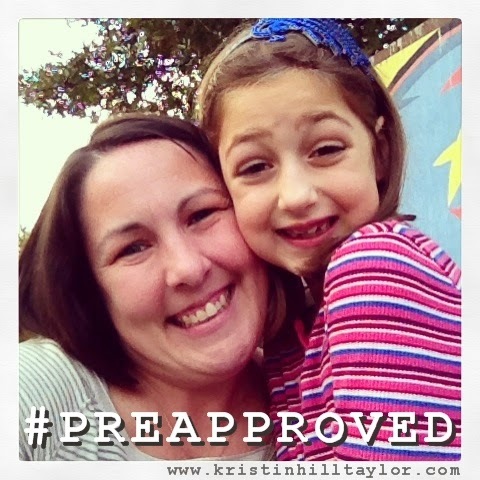 "To be preapproved means this: We love from our approval, not for our approval. We love without expecting anything in return." I named my idol Productivity. That's what distracts me from focusing on loving God and loving others. I've laid it down these past few weeks, although I've failed plenty of times since. But that's not my only idol. I'm a people-pleasing, perfectionist-craving momma who often wonders if she did enough or said the right thing. The replacement loves abound in my heart and I have to give them back to the Maker moment by moment, again and again. But I know my perspective has changed. My to-do list isn't as dominating as it once was. I've yelled less. I've seen my chores and relationships and roles differently. Yes, there's still room for improvement, but at least I know the One is working in changing me. This is a process. I signed in Ben and Cate at the school office at 8:05 and they walked down the hallway to the classrooms. I prayed they carried the truth of being created and chosen by God with them. I prayed they remember they don't have to perform or fit into some mold to know that life-changing love. And I left the school knowing being a few minutes late that morning wasn't going to ruin our day. Those few minutes actually improved our day and most likely our lives. I received a free copy of "Love Idol" for being part of the book's launch team, but I believe in Jennifer Duke Lee's words and am thankful to have this book as a resource. And it's officially releasing early - today! You can buy it from Amazon or many other booksellers. Read the other posts "Love Idol" has inspired here. For more encouragement, visit Jennifer Dukes Lee's website and The Love Idol Movement page on Facebook. I'm also linking up with Jen Ferguson's Soli Deo Gloria party, where idols are also being smashed. Thanks, Beth! It's a truth I have to keep learning myself, that's for sure. I had to take a mental break from Storyline because Love Idol was so powerful for me. I'm glad you have a copy coming! :) And, yes, I'm ready for that visit too! I've missed hearing from you lately. Hope you're having a good week. Much love to you! Yes, yes, yes. This love idol business is changing me as a parent. I was just talking to Greg this morning about how I feel like as God is changing me, he's changing my perspective on my kids and allowing me to be more compassionate and in tune with their needs and struggles. I've got a long way to go, but this has been such an eye-opening journey for me. Stopping over from tellhisstory. Great post. I can so relate as I've struggled with idols of productivity and approval as well. What a great example for your kids though that it's OK if you're late, you had a few extra minutes to talk about what's really important. I'm learning that as we as moms learn to lay down our idols our kids benefit exponentially and learn to do the same. That in and of itself is great motivation. Blessings to you. Thanks, Zohary! It's a process, but I'm glad my daughter can witness God changing this stubborn part of me! Thanks for coming by.